U Boat cruising the seas at sunset. Unknown artist. Good depiction of the solitary existence of the German U-Boots as they patrolled the Atlantic Ocean. What's Painting of a U Boot battling the seas with essential crew on the top of the conning tower on the watch for Allied aircraft or shipping. Artist unknown. E-boats were often used to patrol the Baltic Sea and the English Channel in order to intercept shipping heading for the English ports in the south and east. They were also transferred in small numbers to the Mediterranean, and the Black Sea by river and land transport. Some small E-boats were built as boats for carrying by auxiliary cruisers. Crew members could earn an award particular to their work—Das Schnellbootkriegsabzeichen—denoted by a badge depicting an E-boat passing through a wreath. The criteria were good conduct, distinction in action, and participating in at least twelve enemy actions. It was also awarded for particularly successful missions, displays of leadership or being killed in action. It could be awarded under special circumstances, such as when another decoration was not suitable. During World War II, E-boats sank 101 merchant ships totalling 214,728 tons. In addition, they sank 12 destroyers, 11 minesweepers, eight landing ships, six MTBs, a torpedo boat, a minelayer, one submarine and a number of small merchant craft. They also damaged two cruisers, five destroyers, three landing ships, a repair ship, a naval tug and numerous merchant vessels. Sea mines laid by the E-boats were responsible for the loss of 37 merchant ships totalling 148,535 tons, a destroyer, two minesweepers and four landing ships. Detailed painting of three surface ships after battle as the ship in the foreground has evident battle damage. 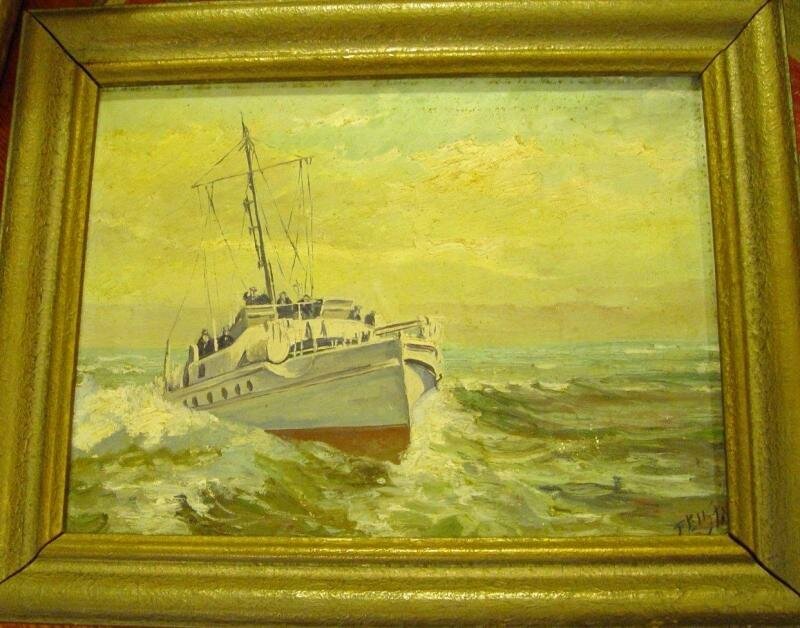 This painting came from Motivedo, Uruguay which was the site of the Battle of Scapa Flow in 1940. It is believed that this is a period piece of the Battle of Scapa Flow as internment documents of two Kreigsmariners from the Graf Spee were inserted behind the frame. The Graf Spee was scuttled after the battle and its crew allowed ot remain in Uruguay. The charcoal drawing below depicts a well camouflaged vessel, probably a minesweeper. The piece was apparently created to commemorate Christmas 1941 as it is inscribed with a holiday greeting along with what looks like signatures of some of the ships officers.